Omaru Falls was a waterfall that snuck up on us. 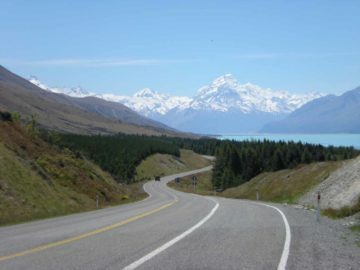 It all started during our first visit to New Zealand in November 2004 when we were driving from Whakapapa Village to Hamilton along the SH4. Along the way, we noticed a roadside sign saying “Scenic Falls 300m”, which kind of got me looking for the pullout the sign was referring to. However, we ended up missing this pullout, and we ended up gunning it to Hamilton as it was getting late in the day. 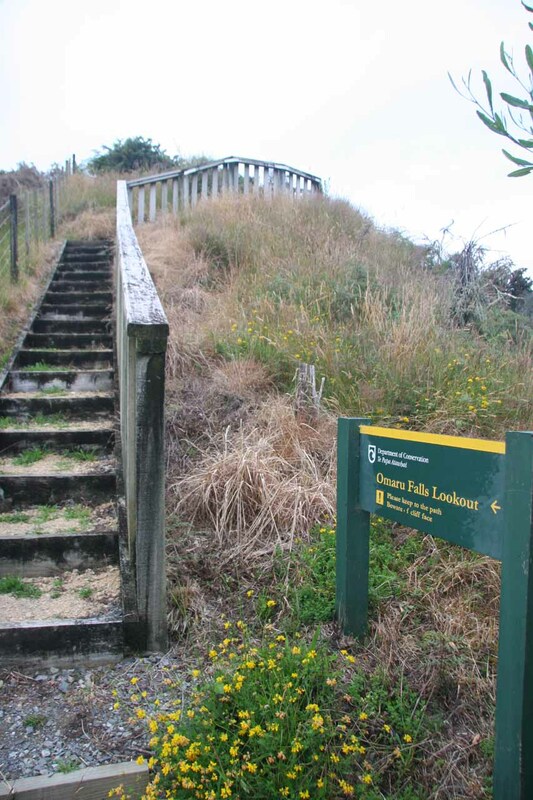 When we did some post-trip research, we came to realize that in the vicinity of the sign we saw, there was the 35m light-flowing Omaru Falls, and the roadside sign we noticed back in November 2004 was actually referring to a different waterfall called Madonna Falls. 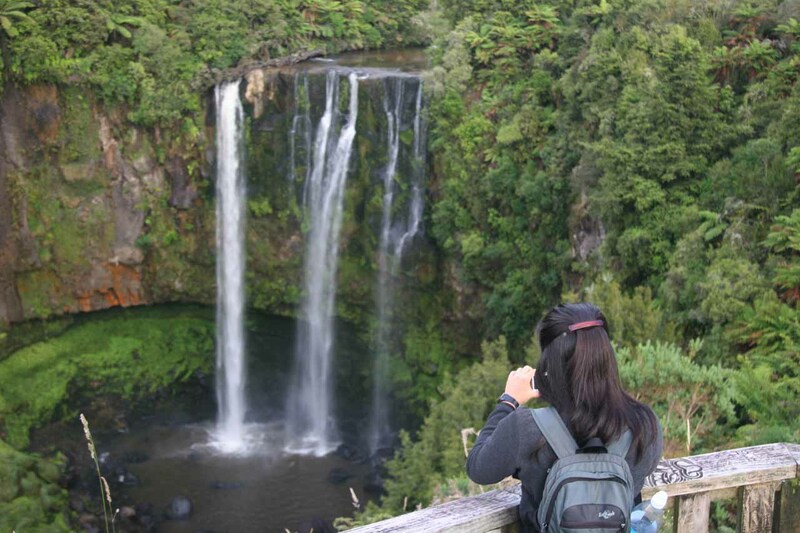 Over five years later in January 2010, we made it a point not to miss Omaru Falls. 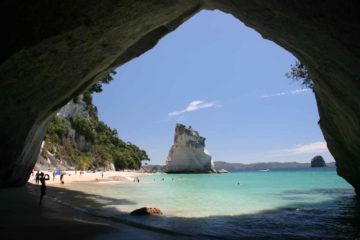 We managed to make the visit as we were driving north from New Plymouth towards Hamilton, then ultimately to Whangamata. From the small pullout area at the trailhead (see directions below), we hopped over a stile and onto a paddock for the first part of the walk. 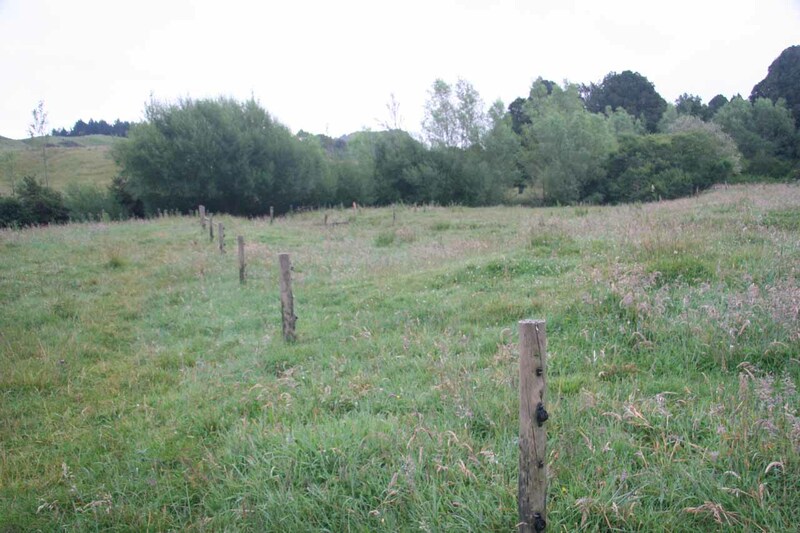 This paddock had some pretty tall grass, which wet the legs of our pants on the morning of our hike, and it wasn’t until we left the paddock over another stile before we left the tall grass behind and entered native growth forest. 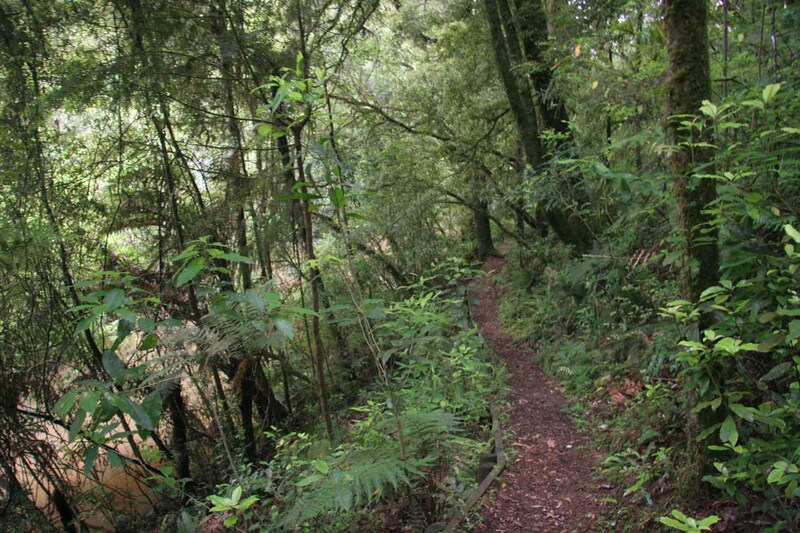 It seemed that the section of track through the native growth forest lasted for most of the overall hike. Given our early start, it was a little dark and we (well, mostly me) frequently had spider webs brush up against our faces. 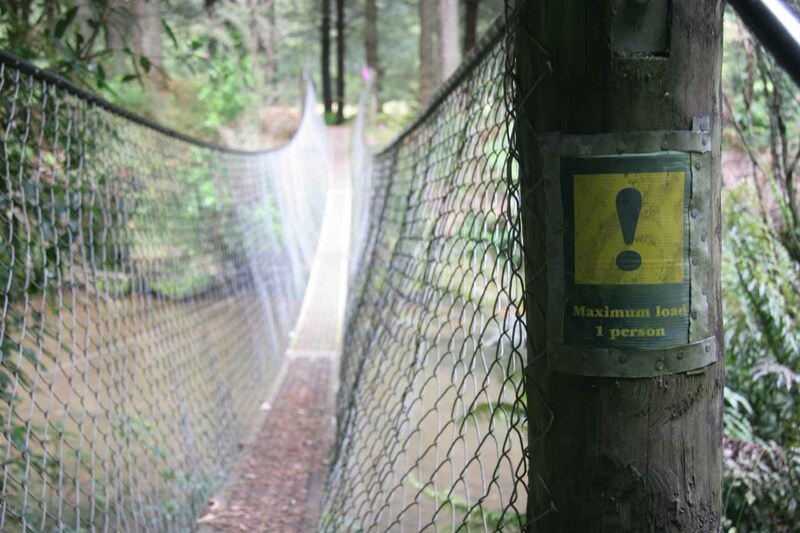 After over 10 minutes (I swore it seemed longer than that), the forest started to open up once we traversed a one-person-at-a-time swinging bridge over the Omaru Stream. Beyond the bridge, the track followed the stream while also following alongside a fence that probably marked the boundary between the reserve and someone’s property. Eventually, after passing by an attractive mini-cascade, the track then climbed up a short flight of steps to an overlook affording a nice view of the falls (as pictured at the top of this page) while also allowing us a look at the gorge further downstream. From what we could tell, there was no way for us to safely get closer to the falls’ bottom. We then returned back the way we came, which resulted in a grand total of a little over an hour’s hike, which the sign accurately predicted (though we originally couldn’t tell if their 30-minute estimate was for both directions or just one-way). 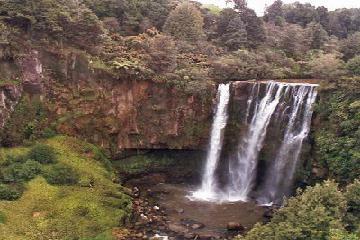 When we returned to the car, we would continue north on SH4 and see that Scenic Falls sign again. And in a bit of deja vu, we missed the pullout it was referring to once again. I guess another visit would be needed to finally see what Madonna Falls would look like in the flesh, but we’re not sure when that opportunity would present itself. 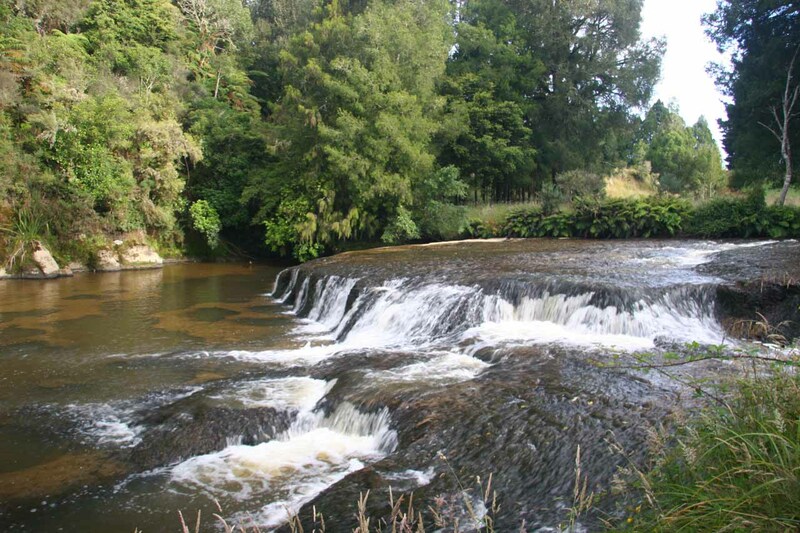 Perhaps the nearest sizable town to the falls was Te Kuiti so we’ll describe the directions from there. From the SH30 and SH3 intersection in the town of Te Kuiti, go 12.5km south along SH3 to the junction between SH3 and SH4. 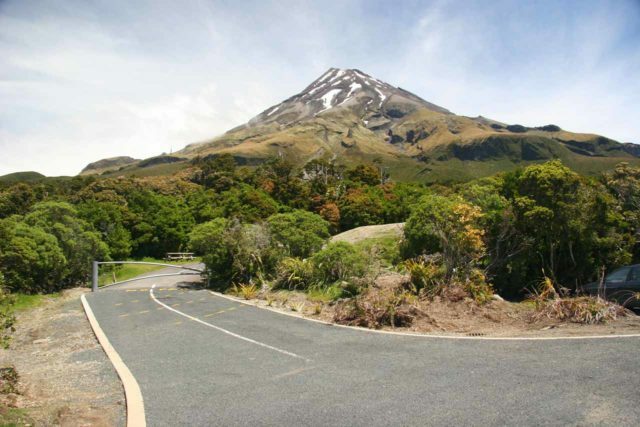 Then, turn left to go onto SH4 and drive another 20km to the signposted turnoff for Omaru Falls on the right. This turnoff was real easy to miss, especially given how fast traffic tended to move on SH4. 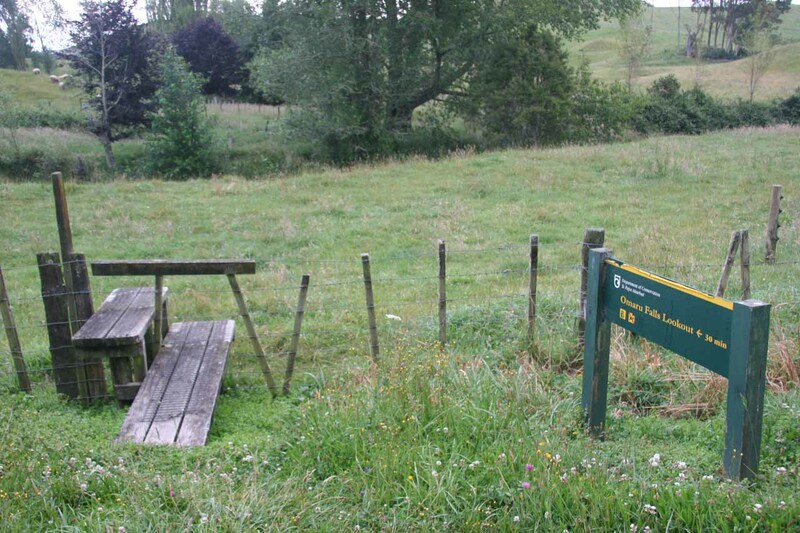 The signposted trailhead was a little over 600m from SH4 on the left side of the road. 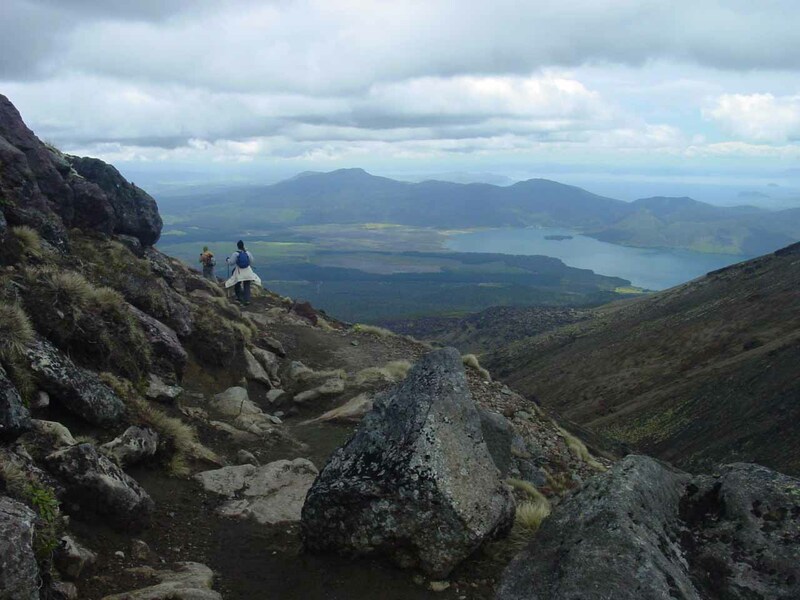 Conversely, we went in the other direction from National Park (near Tongariro National Park). From the SH47 and SH4 junction, we went about 93km north on SH4 to the aforementioned turnoff on the left to Omaru Falls. 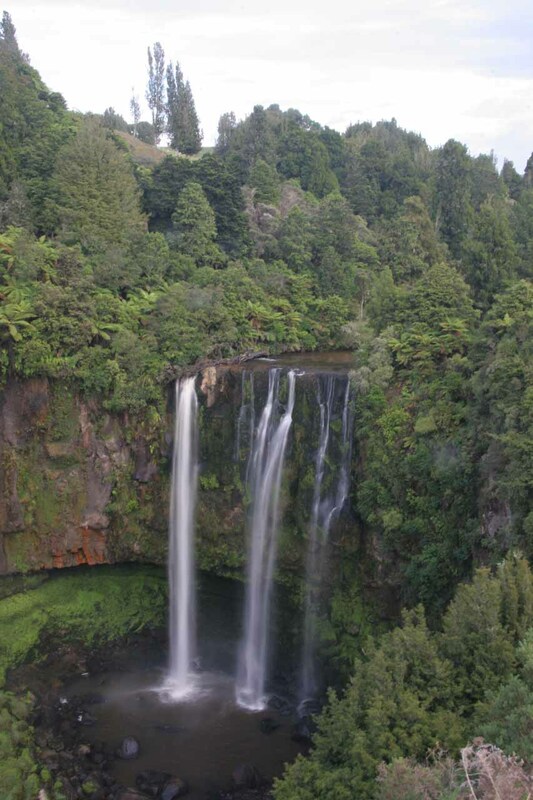 Finally, our last approach that ultimately resulted in our visit to the falls that led to this write-up was from New Plymouth. 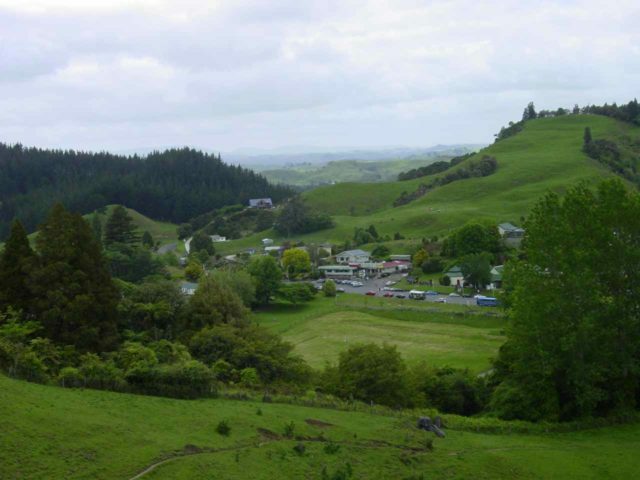 We started off by driving about 124km north on SH3 towards Totoro Rd, which left the highway and went east. 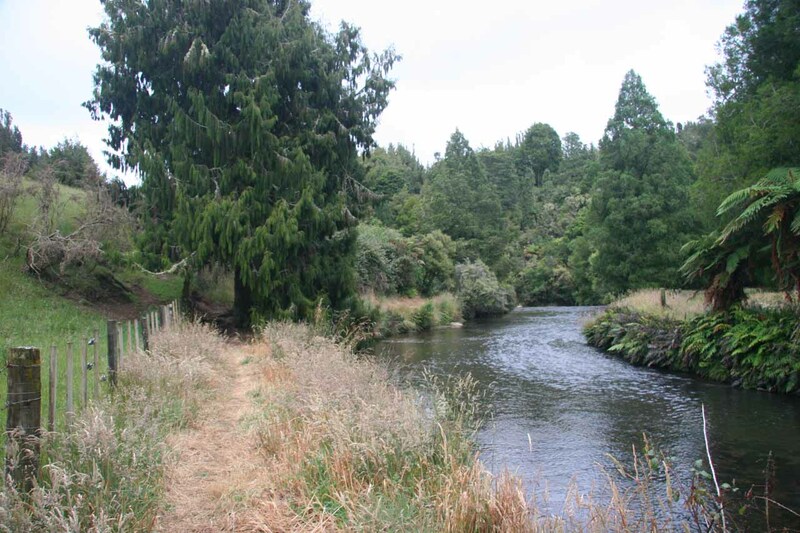 We then turned right onto Aria Rd, which became Ohura Rd, and then became Mokauiti Rd. Mokauiti Rd eventually became Ramaroa Rd, which ultimately joined with SH4 where we took it north towards the Omaru Falls Rd turnoff on our left. 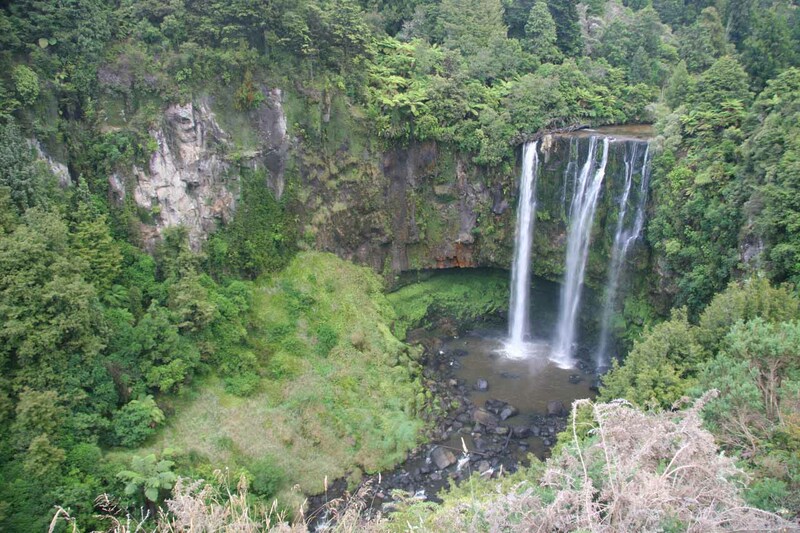 According to the literature, the pullout for Madonna Falls was about 6.4km north of the Omaru Falls turnoff along SH4. 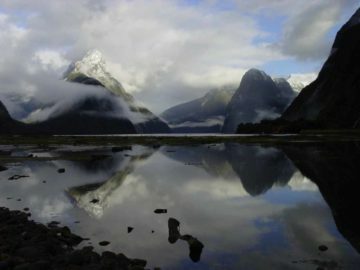 Unfortunately, both times we were in the area on our trips to New Zealand, we missed it. For additional context, Te Kuiti was 79km (a little over an hour drive) south of Hamilton and 203km (3 hours drive) south of Auckland.